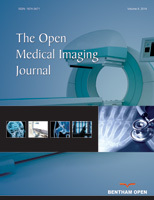 The Open Medical Imaging Journal is an open access online journal that publishes research articles, reviews/mini-reviews, case studies, guest-edited thematic issues and short communications/letters on the latest developments and applications of imaging technology in the diagnosis and treatment of diseases of all kinds. Manuscripts are considered for publication on a range of topics including abdominal imaging, biomedical imaging, brain imaging, cardiovascular imaging, clinical physiology and functional imaging, molecular imaging and biology, neuroimaging, nuclear medicine, and retinal imaging. Imaging techniques covered include microscopy, magnetic resonance spectroscopy, magnetic resonance imaging, diffusion tensor imaging, mathematical imaging and vision, medical image analysis, radiography, radionuclide imaging, echocardiography, computerized medical imaging and graphics, real time imaging, tomography, and ultrasound, optical, non-invasive and X-ray imaging. The journal aims to promote the awareness and understanding of medical radiologists and physicists in the utilization of imaging technology for therapeutic care.